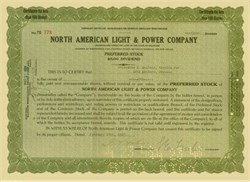 Beautifully engraved early certificate from the North American Light and Power Company issued in the 1920's. This historic document was printed by the American Banknote Company and has an ornate border around it. This item is hand signed by the Company’s Vice-President and Secretary and is over 71 years old. The company was orginally organized to own public utility properties primarily in the gas and electric area. They has over 108 properties including the Illinois Power and Traction Company, Washington Gas and Electric, Citizens Electric Light Comapny and many more. One of the company's founders was Clement Studebaker, Jr who serverd as Chairman of the Board.